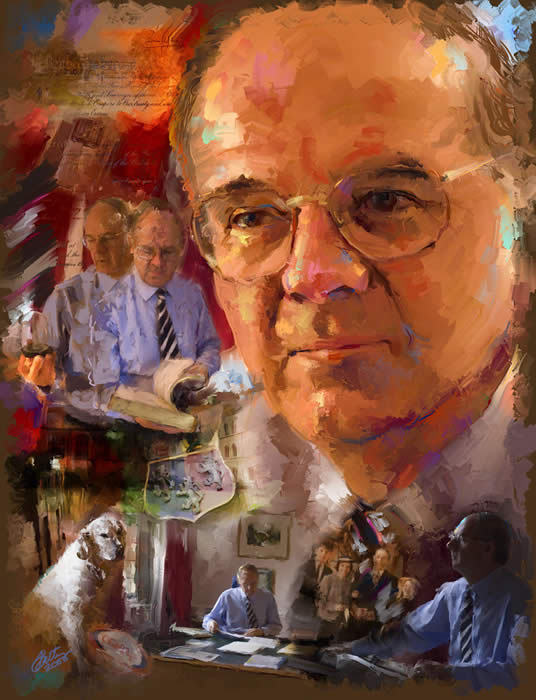 This portrait Mr Giles Henderson CBE, BCL, MA, the former Master of my alma mater, Pembroke College, was presented to the Pembroke College Art Collection on June 23, 2006, and now hangs in the Henderson Building in the new section of Pembroke College on Brewer Street. 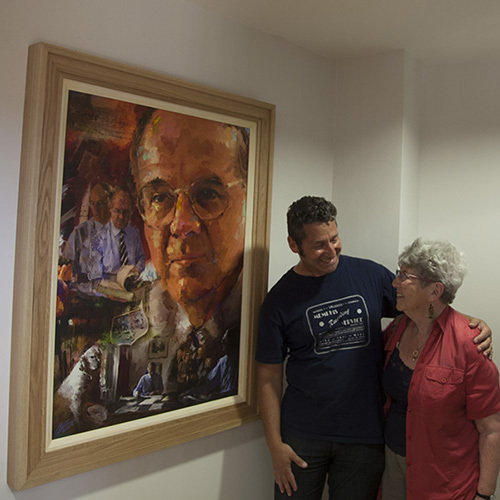 Showing my Mum the portrait in the Henderson Building. I studied Physics at Pembroke College from 1979 – 1982. The painting, an example of my collage portrayal approach to portraiture, captures many aspects of Gile’s life, both personal and professional. 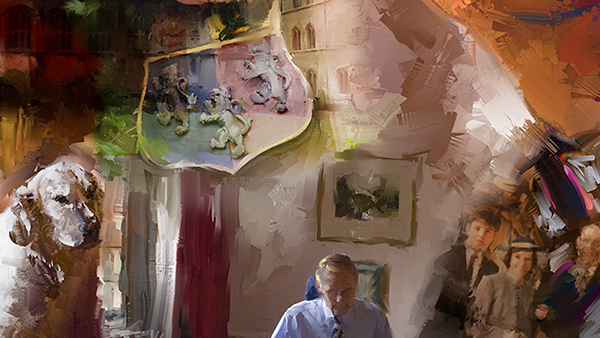 Included in the painting are views of him working at his desk in his capacity as Master of Pembroke College, his beautiful dog Ellie, the college crest, the Pembroke Chapel Quad, and his family on the occasion of being presented with the Commander of the British Empire (CBE) by Queen Elizabeth II. The digital painting part of the creative process was created using Corel Painter and a Wacom tablet on a Macintosh computer. I then printed the digital painting out onto canvas and worked into it with acrylic gel medium and paint. The final portrait is an original mixed media artwork. 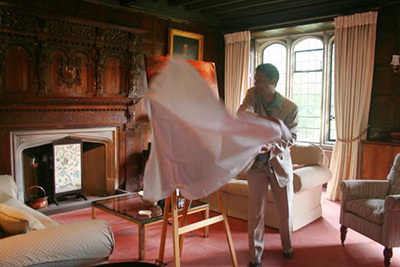 Here are pictures from the unveiling of the painting in the Master’s quarters during the Gaudy (alumni reunion) Tea Reception, June 23rd, 2006. swooosh!! the cover comes off…. 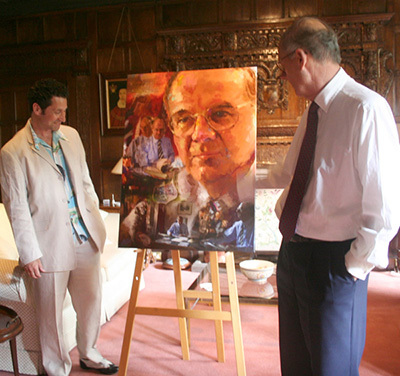 The Master contemplates the painting. 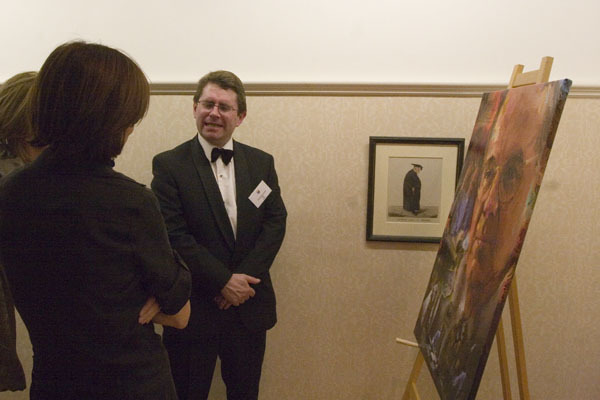 Pembroke alumni Fiona Wailes-Fairburn, Kate Hall-Tipping and Member of Parliament Kevin Brennan discussing the painting. Another example of the ability of Jeremy Sutton … He is truly a great artist with a flair all his own….. He has led me to explore many new roads…Using the Jeremy approach has been an attention getter for art work I have created. Thus my students are still attending my classes..